Roman Polanski is a diverse director and actor. This film proves definitively that he has a wicked sense of humor as well. One can tell this from the whole title of this film The Fearless Vampire Killers, or Pardon Me, but Your Teeth are in my Neck (great charade title!). The concept of Gallows Humor was studied by Sigmund Freud who thought it was a kind of defense mechanism of the ego which wouldn’t allow injury to itself from the stresses of reality. The traumas of the external world would be lessened by humorous perspectives. It’s a cousin to Black Humor. They both treat serious matters such as death, illness, war, and disease in a light, almost mocking manner. Dancing in front of a mirror in a room full of vampires is one sure way to let them know you're not one of them! Gallows Humor was a middle European construct and was imported into other Western cultures through the Jewish community. 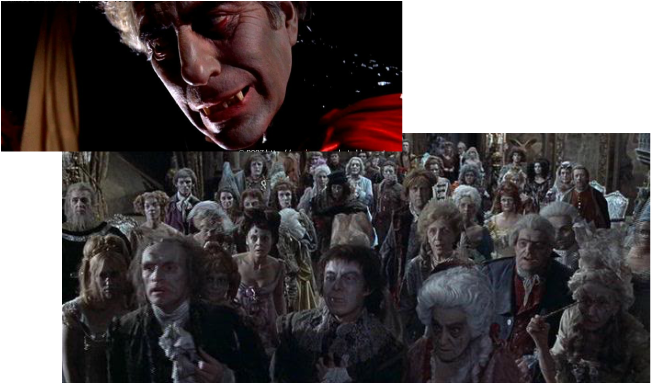 Polanski’s film with its Jewish vampires and its European count who is also a vampire definitely fits the pattern as does Polanski himself. That’s what makes this film stand out – its humorous approach. The two bumbling vampire killers of the title (one of them Polanski himself) never for a second wink at the audience as if they are in on some joke. They are DEAD serious about killing vampires except I don’t think they actually accomplish that task by the end of the film. But fear not…there are some really creepy scenes in this film as well. This IS Polanski after all. The scene where the Midnight Ball guests are leaving their graves is freaky deaky! And for all the homophobes in the viewing audience, there’s a scene on a bed with the Count’s son and Polanski that will probably scare them more than facing a real vampire themselves! But it’s so tongue in cheek that you just have to laugh. Gay vampire...long before Louis, Lestat or anybody in Twilight! Kick back one night when you just want to laugh at one of the best early examples of the sub-genre comedy horror films and enjoy this masterpiece of fright and fun. Bless his little heart, he tries to kill vampires, but he just can't bring himself to do it. Why we sometimes have to laugh in the face of death.